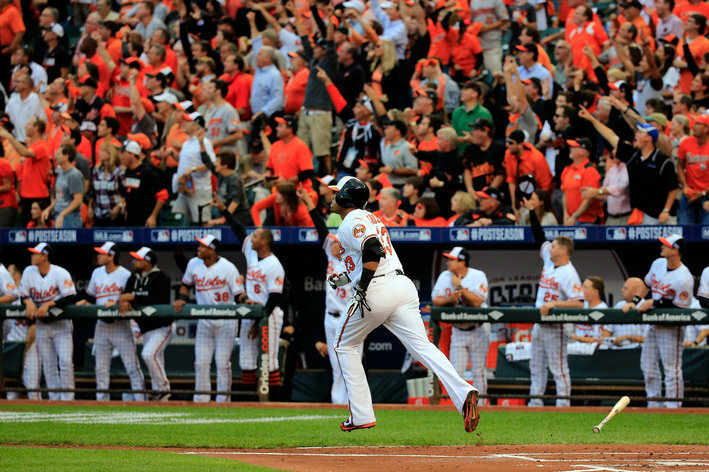 After slugging their way to victory for the better part of the 2014 season, the Orioles continued that trend in their opening playoff game, piling up 12 runs and 3 homers. And while Baltimore piled on a bit once Scherzer left the game, the O’s still managed to tag the 2013 Cy Young Winner with 5 runs in 7.1 innings, which was more than enough for the victory. So how did the O’s do it? Well, for one, they came out of the gates swinging. In the first inning alone, 3 out of the 5 hitters Baltimore sent to the plate swung at the first pitch and put it in play. That aggressiveness early in the count continued as the game wore on. Scherzer faced 29 total batters and a whopping 12 of those Orioles took a cut at the first pitch. Scherzer tends to lead with his fastball more often than not and Orioles’ lineup was ready. Cruz slammed a first-pitch fastball into deep right center to kick off the scoring and by that point it was apparent that Baltimore wasn’t going to let Scherzer beat them via the strikeout. And while working deep into the count is the preferred strategy of nearly every team in the Majors, Baltimore actually played it smart with their aggressiveness in this game for a couple of reasons. Most importantly, the Orioles were able to avoid falling behind in the count against one of the best strikeout artists in the league. Scherzer has posted one of the best strikeout rates in baseball for three years running and he’s not a guy you want to fall behind because it basically gives him license to throw one of his filthy breaking balls. The other big benefit gained is that by avoiding bad counts, Baltimore upped their chances to win simply by putting the ball in play more often. Rather than let Scherzer pile up easy out after easy out, Baltimore forced Detroit’s miserable defense to actually make plays. And while the Tigers’ defense held up their end of the bargain while Scherzer was in the game, it wasn’t long after he left before they totally collapsed, allowing the Orioles to put the game out of reach. It’s this kind of preparation that makes Buck Showalter one of the best managers in the game.